54 June/July 2018 unmanned systems inside O ne of the overarching themes of the Brussels 'Connected Cars Europe' conference was how to accommodate, reconcile and bring together the many competing and some- times conflicting interests of the different future road transport stakeholder communities. At least one presenter felt it useful to point out that connected cars and autonomous cars are really very different things. "There seems to be a fair bit of confusion out there," said Chris Woolford, director of international spectrum policy at the United Kingdom's Office of Communications (Ofcom). "Autonomous cars, almost by definition, do not require connectivity. They can drive them- selves, using equipment that's installed on the cars—sensors, things like radars and cameras. There may be a degree of connectivity, for in- stance to road-side infrastructure, but this is a short-range type of communication." The next level up, Woolford said, involves connectivity to networks, and this could poten- tially provide important information to autono- mous cars. For example, connectivity to some sort of network could provide access to maps, road traffic and road safety information. "All of this is what we call ITS." 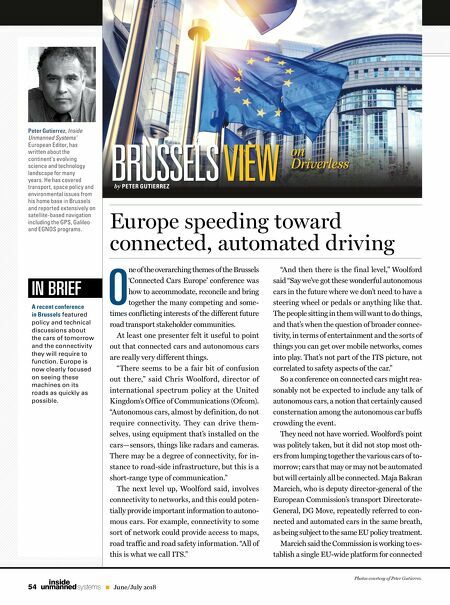 Europe speeding toward connected, automated driving Peter Gutierrez, Inside Unmanned SystemsÕ European Editor, has written about the continent's evolving science and technology landscape for many years. He has covered transport, space policy and environmental issues from his home base in Brussels and reported extensively on satellite-based navigation including the GPS, Galileo and EGNOS programs. IN BRIEF A recent conference in Brussels featured policy and technical discussions about the cars of tomorrow and the connectivity they will require to function. Europe is now clearly focused on seeing these machines on its roads as quickly as possible. "And then there is the final level," Woolford said "Say we've got these wonderful autonomous cars in the future where we don't need to have a steering wheel or pedals or anything like that. The people sitting in them will want to do things, and that's when the question of broader connec- tivity, in terms of entertainment and the sorts of things you can get over mobile networks, comes into play. That's not part of the ITS picture, not correlated to safety aspects of the car." So a conference on connected cars might rea- sonably not be expected to include any talk of autonomous cars, a notion that certainly caused consternation among the autonomous car buffs crowding the event. They need not have worried. Woolford's point was politely taken, but it did not stop most oth- ers from lumping together the various cars of to- morrow; cars that may or may not be automated but will certainly all be connected. 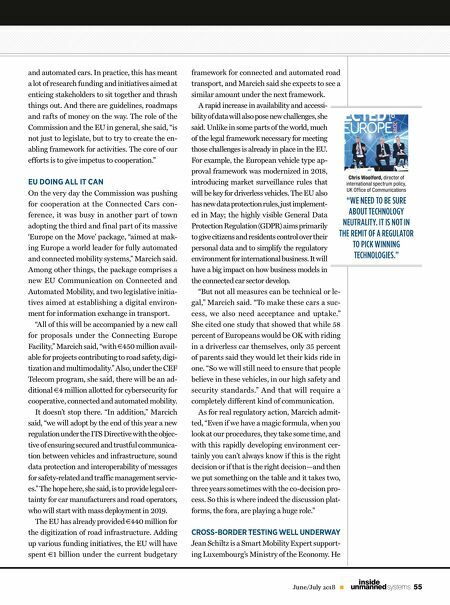 Maja Bakran Marcich, who is deputy director-general of the European Commission's transport Directorate- General, DG Move, repeatedly referred to con- nected and automated cars in the same breath, as being subject to the same EU policy treatment. Marcich said the Commission is working to es- tablish a single EU-wide platform for connected BRUSSELS VIEW on Driverless by PETER GUTIERREZ Photos courtesy of Peter Gutierrez.